I can sometimes taste and smell chlorine in the water. Why? On an annual basis we change our system disinfection process from chloramine to free chlorine for maintenance purposes. While the system is changing from chloramines to free chlorine and then back you might notice some chlorine odors particularly when you are using warm or hot water. These changes are typically done in the fall of the year and last less than 30 days. Questions regarding levels of chlorine, fluoride, and hardness in our drinking water supplies are commonly asked and we have listed in a Table some information regarding these and a few others. * For additional information please contact the Utility Department at 972-875-1234. Sometimes the water coming out of the faucet isn’t clear. Why? If your home or business has old galvanized pipes, they can give water a reddish-brown or yellowish appearance. It is most noticeable if the water has been sitting in the pipes for an extended period of time. Iron is the cause of this color. Water in our system also at times due to temperature changes can have high levels of dissolved oxygen which can cause water to appear milky when it is drawn from the tap. Flowing the water for a few minutes usually clears the from both the iron and dissolved oxygen discolorations. Occasionally maintenance or firefighting activities can result in customers receiving discolored water, even when using best management practices to prevent it. Again, flushing the plumbing in your home is needed to replace the discolored water. 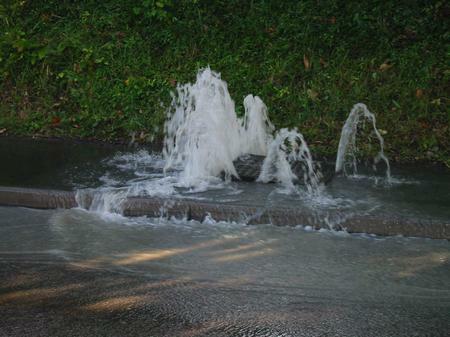 If the water does not clear after complete flushing, contact the Utility Department at 972-875-1234 ext. 2249 to report the problem. If after 5 pm, please call 972-875-4465. We will clear things up as soon as possible. The aerators on our faucets are filled with white debris. What is it? “White chunks” or eggshell-like particles that clog faucet aerators and showerheads are actually pieces of plastic from hot water heaters that are experiencing dip tube failure. The dip tube delivers cold water to the bottom of the hot water heater tank. Many dip tubes manufactured between 1993 and 1996 were found to be defective and, over time, have deteriorated. As the plastic dip tube breaks apart, pieces flow out of the tank through the hot water outlet and clog aerators and showerheads. These plastic pieces could be white or light green in color and if placed in a glass of water they will float. They are in no way toxic and will not make the water toxic. The defective dip tube can, however, affect the performance of your water heater. 1. One is to flush all the dip tube debris from the heater tank, install a new dip tube, and then clean all the strainers and aerators. 2. The second solution is to replace the water heater and then clean and flush the strainers and aerators. Contact a licensed plumber for additional information. Report an electric outage to Oncore. Report a down power line or hanging too low to Oncore. How do I report a Turn of the Century Light out? The City of Ennis owns and operates water mains and sanitary sewer lines located in the public right of way. This is the area that includes the street, the parkway between your property and the street, and in some cases alleys and easements located behind or beside your property. We are not responsible for any water or wastewater plumbing located on private property. The picture shown is of a water leak and leaks can be larger and very evident such as this one or they can be so small they are almost not visible at all. Large main breaks are emegencies and valves to reduce or stop the flow of water will be closed immediately and repairs will begin as soon as all resources are in place and locates of other utilites can be secured. Some other leaks if they are small and not creating urgent problems will be scheduled and rrepaired at a later date. Citizens can play an important role in protecting our water and maintaining our water system. We count on you to help us proactively identify and report all types of leaks or other problems on the City water system. We also rely on your cooperation, patience and understanding when water service is curtailed during repairs. A sanitary sewer stoppage is among the most unpleasant problems your home or commercial property can develop. In addition to water damage and plumbing troubles, you also have the odor to contend with. Natural forces such as tree roots or just a large amount of debris washed into the pipe over time can clog a sewer line and affect every drain in your house. The most common source of clogs in both the private and public sanitary sewer system is grease. Grease is a general classification for fats, oils, waxes and soaps that have a negative effect on the wastewater treatment system. That is why you will hear the term FOG used when talking about fats, oils, and/or grease in general. Help yourself and your community. Every time grease gets in pipes, it causes problems for the city’s entire sewer collection system and the wastewater treatment plant. It can even cause sewage backup, which is a serious health hazard. Help the environment. When FOG accumulates in sewer systems and leads to overflows, sewer waste ends up in lakes, streams and oceans, causing serious damage to the ecosystem. Pour fats, oils and grease into a container and store in the freezer and then put in the trash after it has hardened. Use paper towels to wipe greasy dishes before dishwashing. Use sink strainers to catch food waste during dishwashing. Put food scraps in the compost or in the trash. How do I schedule a Water or Waste water Treatment Plant Tour? To schedule a Water or Waster Water Treatment Plant tour, please contact the Director of Utilities at 972-875-1234 ext. 2249. Let's Tackle the Grease in This Kitchen. You will be re-directed to the Texas Commissoin of Environmental Quality website.